As one of the most popular destinations in South America, Peru enjoys a seemingly endless list of places you must visit and things you should try. The country is so diverse that in one trip you could experience the thick jungles of the Amazon, snowcapped mountains, the desert landscapes of the Nazca Desert and the beautiful beaches on the north. They are all worth visiting, but most of us don't have the time to see it all. To narrow it down for you, here are five of the most impressive places in Peru that you shouldn’t miss visiting, especially if this is your first trip to the country. Nazca has one of the most outstanding and mysterious groups of geoglyphs in the world. Etched in the sandy surface of the desert plateau, over 300 figures made of straight lines, geometric shapes and representation of animals, plants, and even humans still baffle scholars as to what they mean and why were they made in the first place. What is known, though, is that they were carved around 200 BC – 600 AD by the Nazca People and were made to be seen only from the sky. The lines are shallow designs made in the ground by removing the reddish surface pebbles to uncover the whitish ground beneath. But, the most impressive aspect of these geoglyphs is that they have survived for centuries virtually untouched thanks to the dry and windless climate of the area. You can take a short scenic flight from Nazca, or even from Lima, to see the magnitude of this geologic and historical wonder. From the air, you can spot some of the most popular figures like the monkey, the “astronaut,” spider, and a series of zigzags and geometric figures that defy all logic. Cusco is possibly one of the most beautiful cities in Peru, not only for its Spanish architecture but also for the preservation of some of its ancient Inca architecture. Cusco was the historic capital of the Inca Empire from the 13th century until the Spanish conquest in the 16th-century. Today it is a UNESCO World Heritage Site and the jumping off point for most travelers visiting Machu Picchu. Do not miss visiting the stunning Plaza de Armas and its Cathedral, the stone of 12 angles (an elaborate giant stone perfectly cut by the Incas), Qurikancha, and the Inca ruins of Saksaywaman. Pay attention to the architecture and many of the walls in the city. You’ll notice some of them have perfectly laid rocks on the bottom half, topped by a more rugged, almost sloppy construction on the top. The bottom half was built by the Incas, while the top was rebuilt by the Spanish using the Inca foundations. Also, don’t miss the Peruvian cuisine in Cusco, which is one of the best to be found in the country. This is the crown jewel of Peru; the reason most travelers visit the country in the first place. As one of the most impressive UNESCO sights, and one of the New Seven Wonders of the World, Machu Picchu should be a must-do on your trip. Reaching the ruins is easier than many travelers think, with a comfortable train ride from Cusco to Aguas Calientes –the town at the base of the ruins– followed by a short bus ride to the ruin gates. For more adventurous travelers, you can take a bus from Cusco, followed by a three-hour hike to Aguas Calientes, and subsequently to the ruins, or do the famous Inca Trail – a 3 ½ day hike following the path the Incas laid to reach the sacred city of Machu Picchu. You finish the hike during sunrise at the "sun gate" to witness how the sun hits the ancient city from the most sacred point at the top. Most archaeologists believe that Machu Picchu was built in the 15th century as an estate for the Inca emperor Pachacuti, but was abandoned a century later at the time of the Spanish Conquest. Locals living in the area knew about the ruins for centuries, but the ancient city remained unknown to the outside world until American historian Hiram Bingham brought it to international attention in 1911. When visiting, make sure to dedicate at least half a day to explore each area of the ruins, and if you’re not afraid of heights, climb Wayna Picchu – the iconic towering mountain on the background. For Wayna Picchu, make sure you buy your tickets weeks ahead of time as it has limited access and is often sold out. Puno is a city on the shore of Lake Titicaca, and while the city itself has its charms, with its regal plaza and cathedral, the main reason tourist come to Puno is to jump into Lake Titicaca and visit its floating villages. The Uru indigenous people live on forty-two self-fashioned floating islands made out of dried totora reed – yes, floating islands made of plants. The Uru not only build their island out of reed, but they also make their homes and boats with the same material. Without a doubt, this is one of the most culturally unique places you’ll find in Peru and South America. You can visit the islands on a short half-day trip, or you could choose to spend the night at a homestay. Whether you spend the night or not, you’ll be impressed by their unique construction skills and their beautiful culture. If you’ve ever wanted to visit a desert oasis, like those commonly seen in cartoons, then Huacachina must be on your list. This small oasis, with over 150 residents, is easily accessible from the town of Ica – just 4 kilometers away. Huacachina is very small, with only a few streets bordering its lake –or oasis– but what it lacks in size it makes up with fun adventures on its towering dunes. You can spend the day sandboarding and dune buggying across the desert dunes. 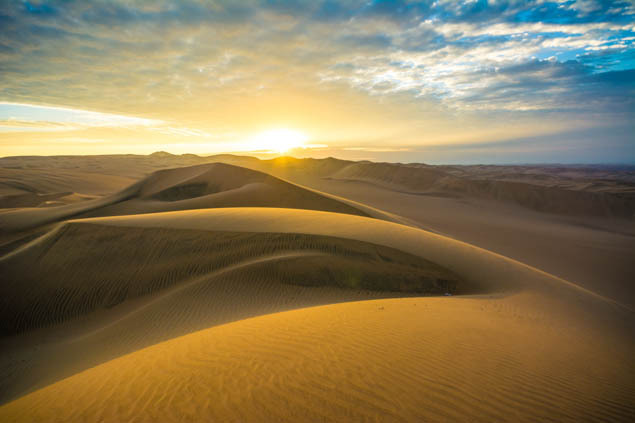 Don’t miss watching the sunset from the top of the dunes and hiking around Huacachina to get that iconic shot of a tranquil oasis surrounded by what seems like endless miles of desert. Huacachina is also well known for its laidback vibes, so get ready to spend a relaxing night at the oasis or jamming to some reggae and other chill tunes. Which other places would you recommend visiting in Peru?